Sharpening Minds | THE GOOD . . . THE BAD . . . AND ME. They say wit is a sign of intelligence. But does wit really glorify a person and revered as someone intelligent or just a smart-mouth and perhaps an obnoxious know-it-all? Regardless of what it is, a witty person has a solid backing of a good intellectual training. I admire people who can banter with me with ease and get all my quips and well-phrased sarcasm (without sounding offensive, of course). I admire people who never get turned-off whenever they find themselves in the company of someone who’s obviously smarter than them — especially in a conversation between a man and a woman. I admire people who are never afraid to show others that they have something substantial between their ears other than a gooey gray matter. Most of all, I admire a person who will admit that they don’t understand what I’m talking about rather than pretend they do. A sharp-witted person belongs to a dying breed. Why? What is wrong with this era? 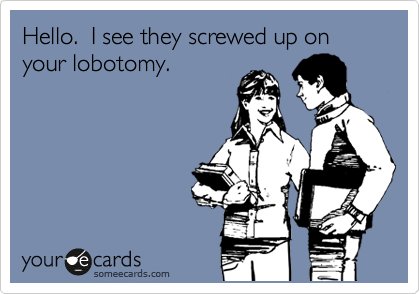 Did all YAs went through lobotomy just like in the film “Disturbing Behavior” to make most of them bland thinkers? I don’t want to generalize or anything, but I can’t help but compare the time when I was a newly grad to the quality of graduates in more recent years. The level of intellectual and emotional maturity is not the same anymore. It’s getting more and more difficult to have a decent conversation that evolve around less simplistic point of views with them. I know I sound too harsh and critical, but I cannot help it. It seems that an average twenty-something has an psychological/intellectual maturity of a teenager. At least for those I had conversations with like street-smart topics and twenty-somethings during my time usually talks about. Which comes to mind . . . In this century, it is preposterous to be dim-witted. With all the technology and information easily accessed, it is close to impossible not to create more and more people with sharp minds. However, the case is the opposite. Has the convenience of this decade made YAs depend on it too much, creating a chain effect that affected both their intellectual growth as well as emotional maturity? Whatever the root cause of this situation, it still made me uncomfortable to think that when the time comes that I have children of my own, the same thing might happen unless I step in and do something about it. But knowing me, there’s a high possibility of integrating some of what my parents did to enrich our minds when we were children to my future kids, which includes a deep appreciation of the liberal arts and culture — something that is waaaay lacking in today’s education and youthful exposure.